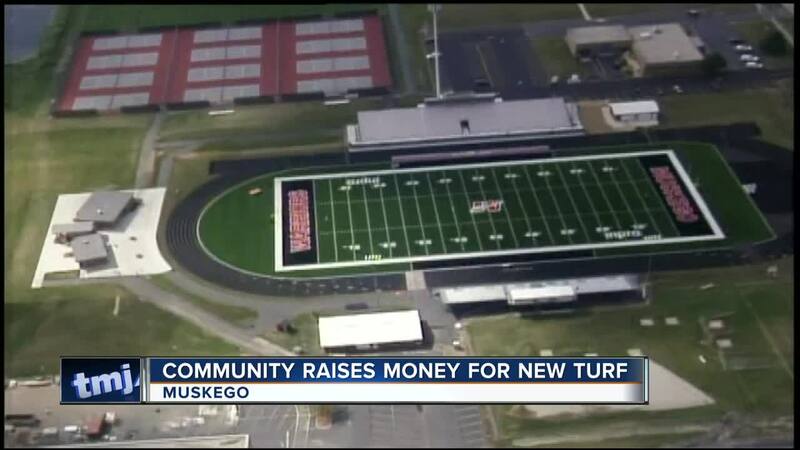 MUSKEGO -- Some warm hearts raised enough money to finish a dream project for Muskego High Schoolers: a brand new football field. It cost $715,000 and was funded entirely by private donations. If you look close at the turf, you will discover the green grass is made of plastic. Tiny rubber pellets are mixed in underneath. School leaders explain how it could help prevent concussions. "Most concussions are head to ground contact when you're stepping on it you feel kind of a bounce," said Steve Cianciolo. "Underneath it is about eight to 10 inches of stone, and then a system of drain tiles," said Cianciolo. "This field can actually, we've been told, can handle ten inches of rain an hour." It was completed one year ahead of schedule thanks to a $600,000 donation by local Inpro Corporation. Parents in the Grid Iron Club helped raise the rest. "I think the turf finally puts us at par with our competitive schools," said Shelly Wohler, of the Grid Iron Club. They still have another $35,000 to pay off all the turf. Click here to find out more. The district also made improvements to their concession and stadium. The ribbon cutting for the new turf is at 6 p.m. on Friday. The Muskego Warriors will then play Arrowhead at 7 p.m.